← Today on Planet Loewenstein…. Sri Lanka can never beat the West. Regardless of how democratic, peaceful, law-abiding, rich or powerful Sri Lanka may become, there’s one area in which it will never, ever beat the West. This is the highly skilled area of causing massive civilian casualties and human rights abuses during military action against hostile states, insurgents and terrorists. It takes decades of practice to achieve such a high level of skill (as the West has done) to rack up telephone-number sized, civilian kill rates. Western politicians, human rights organizations, civil society activists and their pro-LTTE followers have led an unceasing campaign to indict Sri Lanka’s democratically elected government and armed forces for the bloody and ruthless manner in which LTTE (one of the most effective and murderous terrorist groups of the 20th Century) was finally annihilated. Yet these Western moral arbiters are unwilling to look at their own conduct in their wars of choice against real and perceived enemies. 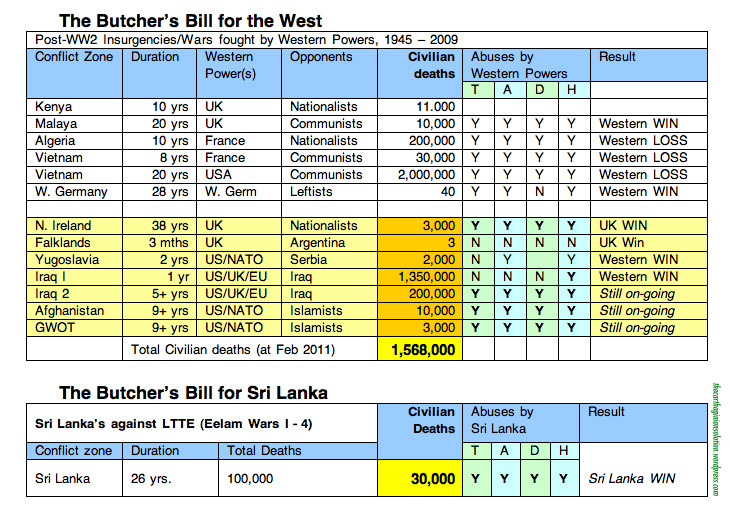 When the West is held to the same standards demanded of Sri Lanka, an entirely different picture emerges – that of civilians killed (in far away countries) in truly awe-inspiring numbers by industrialized, efficient slaughter and of human rights abuses easily surpassing Sri Lanka’s own. Who’s killed the most civilians? The West. For ease of comparison, let’s compare the civilian death tolls in the last 30 years, which equals the period during which the LTTE pursued its failed campaign for an ethnically pure ‘homeland’ within Sri Lanka. 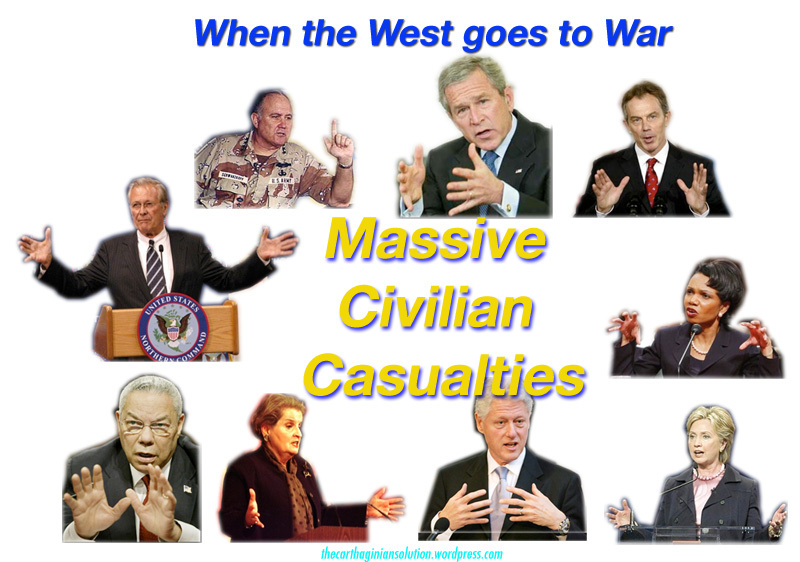 The West wins by a huge margin of 1,538,000 dead civilians – mainly Arabs. Congratulations to the Western governments and military leaders who worked so hard to achieve this unbeatable score. Wars fought by Western proxies (e.g. Contras) are not counted, only those with direct Western military involvement. Casualty figures are only approximate. Iraq War I included 500,000 excess child deaths due to Western sanctions. Note the very low civilians casualties in the Falklands, because the war was not fought in urban areas. The casualties resulting from Western military campaigns in the immediate post-World War 2 period (e.g Kenya, Vietnam) are shown but not counted in the comparative period. Sri Lanka’s absolute victory against the LTTE quickly was followed up by Western politicians and pundits (90% of whom had claimed the Sri Lankan forces incapable of a decisive victory) declaiming that the Sri Lankan ‘solution’ offered no ‘lessons’ due to civilian casualties and human rights abuses. For Kaplan, Sri Lanka was too ‘brutal’ in pursuing the ‘morality of the results’ in its existential struggle against the Tamil Tigers. Internal consistency appears not be Kaplan’s strong point. The abuses committed by the West and Sri Lanka are integral (and unacknowledged) components of all counterinsurgency campaigns. Some representative examples will suffice to prove my point. 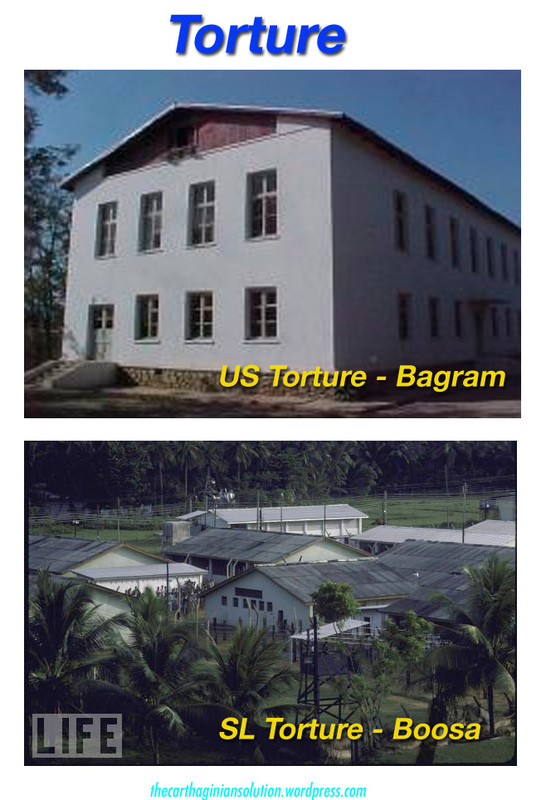 Torture: NATO uses Bagram and other outsourced camps and Sri Lanka has Boosa Detention Camp, an in-house facility. Results vary but unfortunately torture appears to work, hence its continued use. Abduction: The US/NATO alliance abducts suspected Islamic terrorists and sympathizers on CIA Gulfstream private jets. 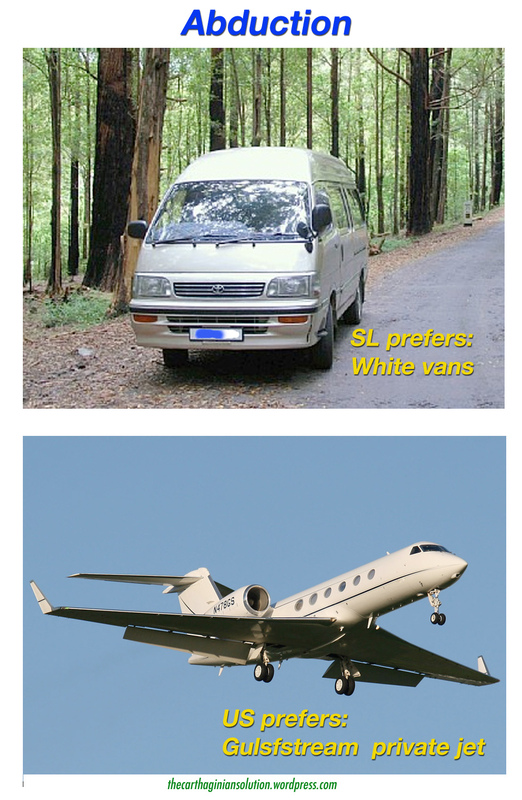 Sri Lanka abducts suspected Tamil terrorists and sympathizers in Toyota Hi-Ace white vans. The CIA provides better catering and comfort levels. Van or G5, the end result's the same. 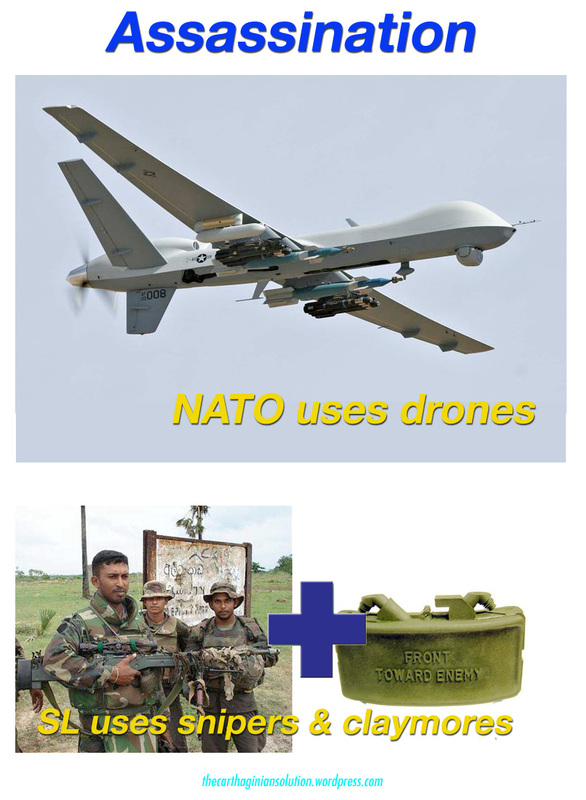 Assassination: The US/NATO alliance use drones in Pakistan & Yemen. President Obama calls this “living by our values”. The UK’s SAS executed an IRA bomb squad in Gibraltar. Sri Lanka used LRRP Units to kill senior LTTE commanders. Expensive assassinations by the West, cheaply done by Sri Lanka. 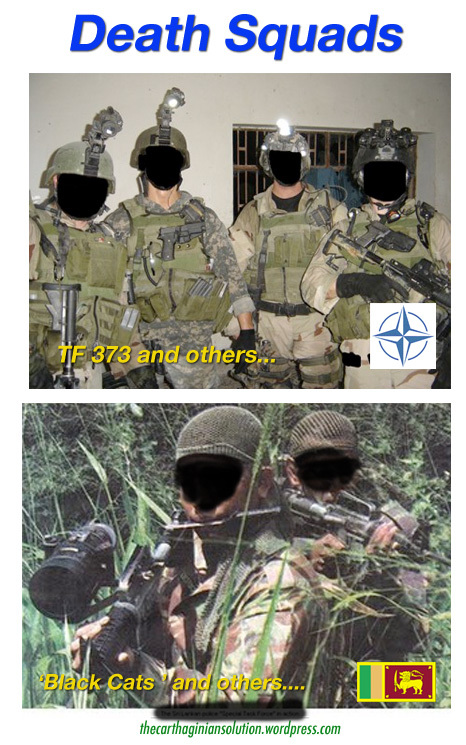 Death Squads: The US/NATO uses Iraqi and in-house death squads. Sri Lanka used paramilitary death squads with a built-in deniability factor. The difference is that NATO pretends to be shocked, when they’re caught. Human Rights Abuses: Too many to list! 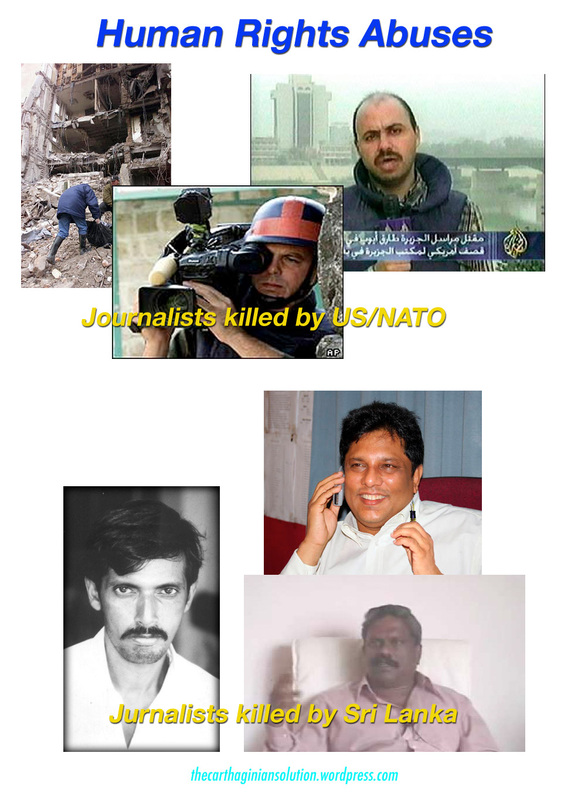 The US/NATO kill Serbian journalists, bomb Al-Jazeera’s offices and kills journalists investigating the activities of Western death squads. Sri Lanka kills and disappears its own journalists investigating corruption, death squads, human rights abuses and for supporting the LTTE. No Western political or military leader has yet been indicted for War Crimes, punished by their domestic courts or even been pursued by human rights organizations like Amnesty International and Human Rights Watch. And these people now want to judge Sri Lanka? 8 Responses to Sri Lanka can never beat the West. 1.Just because the West has been killing others doesn’t mean that Sri Lanka can kill its own citizens. 2. Whose count is 30,000? My point isn’t about SL killing its own citizens, but that those who cause 1.5 million civilians deaths (without any consequences) cannot stand in judgement over SL, whose civilian death toll is tiny in comparison. The 30,000 figure’s for civilian deaths for the entire Eelam Wars 1-4 and is a very approximate number. Even the UN can only guess at the TOTAL deaths (civvies and combatants) to be between 80,000 to 100,000. That’s a very large margin, no? You know about SL war casualties; everyone lies. The GoSL, LTTE, UN, the press & human rights groups. Everyone lies. Anyway, our slaughter is now at an end. The West’s slaughter in AfPak & Iraq continues. I dissagree with the author of this post. As the lone Hegemony in the world today, the western world looks to the US as a police for the world. The US has a huge responsibilty and is stretched across the world, using its own resources , in attempting to appease everyone; well, that cannot be done. We are always gonna have critics who believe their toturous methods are justified because they kill less people. What if they had the military might of the United States? I’m sure the world would be a much more chaotic and brutal place than it is today. I’m not condoning toorture or civilian casualties. The U.S. is constantly creating technology to prevent civilian casualties, while the Sri Lanka government doesn’t even think of this as an option. They just want to inflict as much fear as possible in order to achieve their political objectives. I have openly criticized U.S. policy when it comes to the war in Iraq, in Afghanistan and the tortures at Abu Graib and other sites away from US soil. To state that all Americans are complicit in these acts, which are largely top secret, is ignorant. Many Americans protest US involvement in these countries and we have important elections coming up to prevent the Republicans, who orchestrate most of these acts, from gaining complete power. Learn about what really goes on in America, from bloggers like my self , and then make your case. Americans have had a proven history for protesting human rights abuses everywhere in the world, including the war in Vietnam, so speak of these acts too when attempting to condemn the west. I have to agree with the author of this post. The west has been on a killing sphree for the past many years. Why not take in to consideration the wars they had with many countries including Cuba, Egypt, Somalia and even Vietnam where they lost their faces? We see them as Big bullies than a big brother who is interested in world peace. The world should understand that it is over in Sri Lanka and that Sri Lanka has begun to move on. I think it’s time the west and the rest of the world to join hands with Sri Lanka in this move to ensure that theinnocent citizens of Sri Lanka build their lives from what they lost over the past 30 years. The SL govt did what it could with the limited tools at its’ disposal. Was it callous? Yes. Unlike the West, SL couldn’t afford to engage in endless wars. Eelam War 4 had to be finished quickly before pressure to stop and let the LTTE escape, yet again, became irresistible. If the SL govt had fought in the style of the US/Russia, using US/Russian-style force protection doctrine and overwhelming firepower as seen in Grozny and Fallujah, the civilian casualties really would’ve been horrendous. I know about the US and its politics and have no illusions about the West’s proclaimed moral superiority when engaged in conventional and unconventional wars. Superpowers (like superheroes) live by different rules to ordinary, mortal countries. 🙂 Every single instance of torture, civilian deaths, human rights abuses etc mentioned above have occurred. Both SL and the West are equally culpable, yet the latter wishes to judge the former. I totally agree with the author, but most people are far too brainwashed or simply aren’t sincere enough to admit that the West has been the most aggressive “civilization” in human history. Superb analysis of the truth! There are world wide killings for the sake of $$$. Weapon and Oil led motives created most of these killings. The need of being wealthiest and powerful nation/race has created cruel agendas of wars and spreading and fuelling terrorism in Oil fields and other key countries. TRUTH never wins its just POWER which always win. The truth which is written over in this blog is like a small drop of water when compared to the USA/EU led western media. My salute to your courage in standing for the truth.